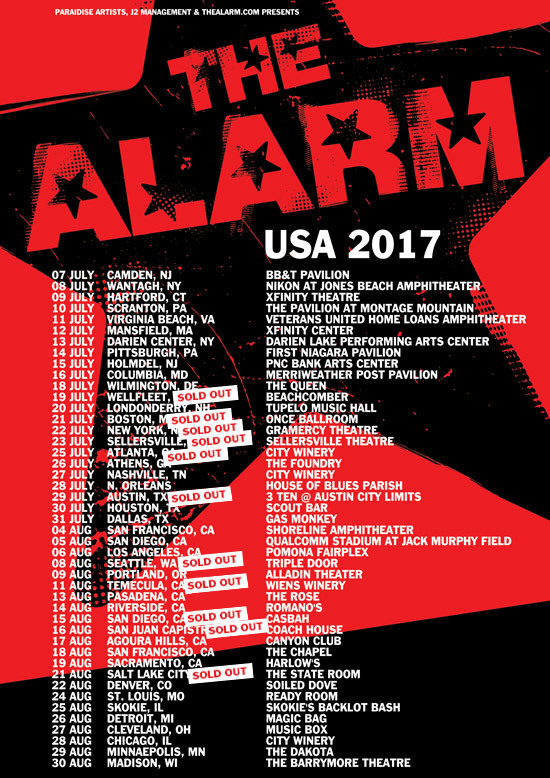 The Alarm 2017 USA Headline Tour is now in full swing. 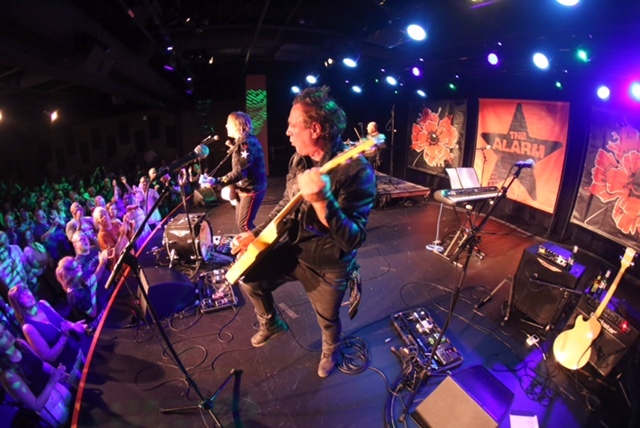 Following on from some amazing opening headline concerts on the Eastern Seaboard, the band is now all primed and ready for a run of four straight sell out concerts in Boston, New York, Sellersville (Philadelphia), and Atlanta. 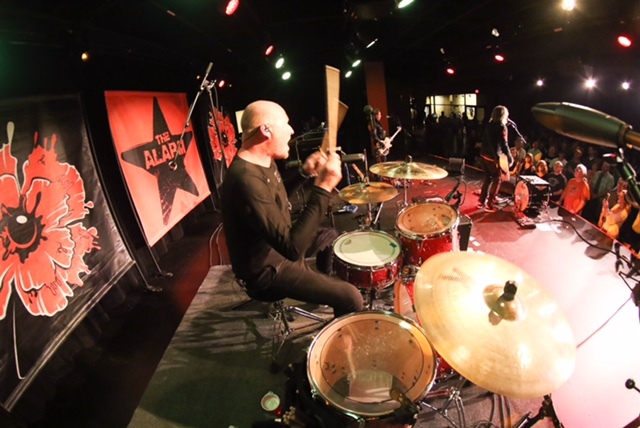 The band have cut loose from the 25 minute bursts of stripped down excitement that was the theme of the Vans Warped Tour and have already performed some diverse set lists on the three shows so far. At The Queen in Wilmington, Delaware a seriously enthusiastic audience welcomed the band back to America with incredible enthusiasm. 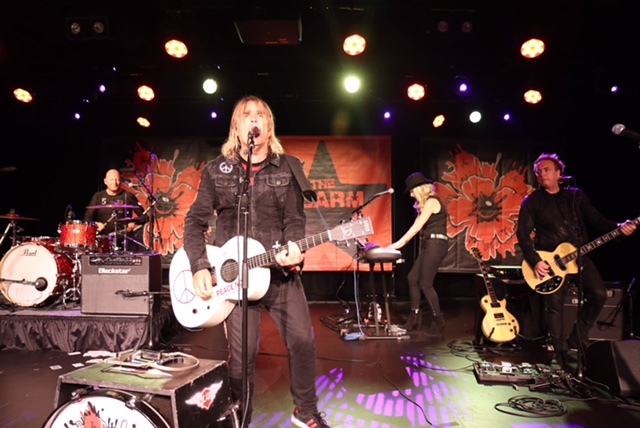 The band were on inspired form, and rose to the occasion by introducing some of the newer material from ‘Blood Red’ including a forceful version of ‘Coming Backwards’. The refrain of the closing ‘Two Rivers’ was taken up by the audience as they left the building with many staying behind to sign up to the International Bone Marrow Donor Registry at the Love Hope Strength ‘Get On The List’ booth. 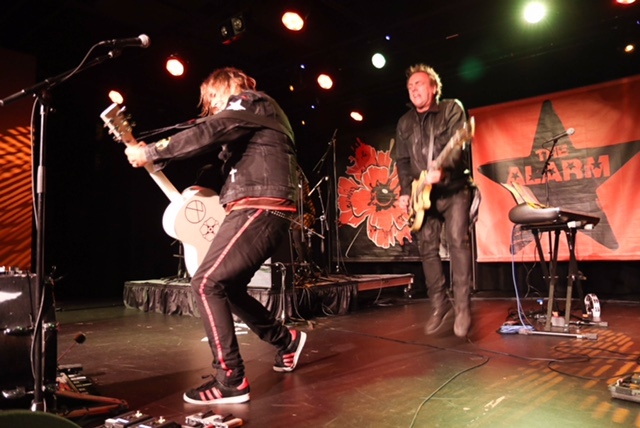 The first two nights of the tour were added late to the itinerary, and although considered to be warm-up shows, you would never have known, especially when the band took to the stage at the beach side venue in Wellfleet, Massachussets. A packed house was again in full voice as Mike Peters opened up the show solo, with an acoustic ‘Unsafe Building’, before guiding the band and audience through a ‘storytellers style’ set list that ran in chronological order through Alarm history stopping at songs and stories from each and every album of the 1980’s. Highlights included an impromptu jam of The Clash’s ‘Magnificent Seven’ during ‘The Stand’ and a rip through the Neil Young / Alarm classic ‘Rocking In the Freeworld’ from 1991’s ‘Raw’. Proceedings were finally brought to a close with the newest Alarm anthem – ‘Two Rivers’. 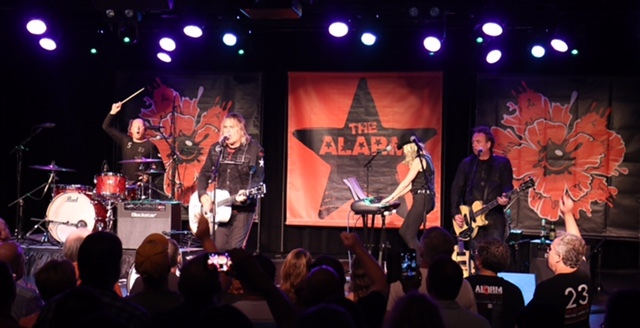 In between shows, Mike Peters and The Alarm have been performing live radio sessions to invited audiences and before the New Hampshire show at the Tupelo Music Hall, the group appeared live on ‘The River’ a powerful independent radio station in Boston. Beginning with a Q&A style interview focused on the film ‘Man In The Camo Jacket’, the acoustic set that followed showed another side of the band’s burgeoning musical dexterity, with Smiley taking his drums and percussion into a different dimension of rhythm that perfectly complimented the melodic and running bass style of multi instrumentalist James Stevenson, who also doubled up on electric guitar during the dialled back atmospherics of ‘Rain In The Summertime’. Later that evening at the Tupelo Music Hall in Derry, New Hampshire, the band again ramped things up with an opening salvo courtesy of the old skool classic ‘Marching On’ that went straight into ‘Where Were You Hiding?”, the focus again soon shifted to newer material and a rare performance of ‘Breathe’ with a swirling string arrangement from co-writer Jules Jones Peters. The seated audience were taking it all in and giving great energy back prompting the band to launch into a hyper charged version of ‘Superchannel’ that brought the entire venue to its feet for ‘My Town’ and ’45 RPM’. 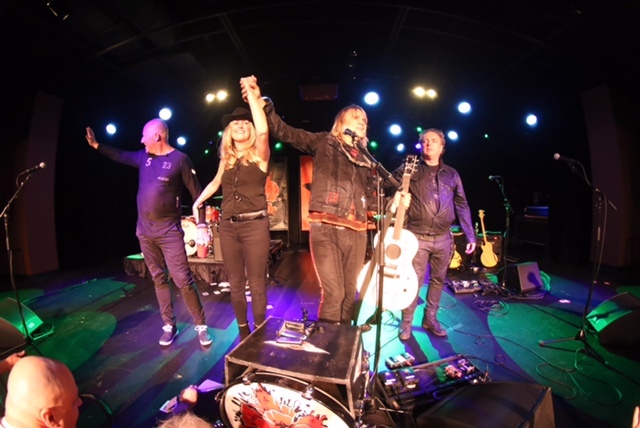 ‘Strength’ and Two Rivers’ brought events to a close and with a final thank you to each and everyone present, the band left the stage with thoughts of Sold Out shows in Boston, New York, Sellersville and now Atlanta, Georgia awaiting them in the coming days. All shows on the East Coast of America are now completely SOLD OUT including the show at Atlanta, Georgia. Tickets are still available for the shows that follow in Athens, Nashville, New Orleans and on into Texas next weekend. The concert at the City Winery in Nashville, TN on July 27th will also feature a pre-concert screening of Man In The Camo Jacket with tickets available here. Concerts in San Diego, San Juan Capistrano, Salt Lake City and Seattle have now also SOLD OUT with a second night added at Seattle. Other shows in San Francisco, Sacramento and Denver are all getting close to capacity. The new album ‘Blood Red’ is available to order here.